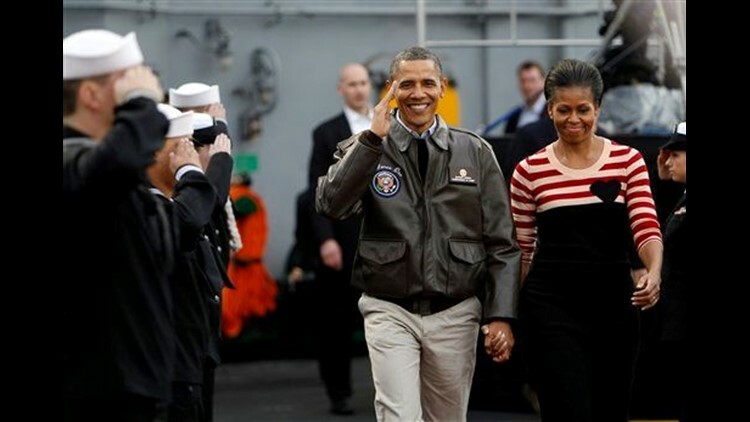 CORONADO (CNS) - President Barack Obama and first lady Michelle Obama arrived in San Diego Friday to watch North Carolina face Michigan State in the inaugural Carrier Classic college basketball game aboard the USS Carl Vinson. The game began at about 4:35 p.m. on the flight deck of the aircraft carrier from which terrorist leader Osama bin Laden's body was tossed into the Arabian Sea following his death in May. About 7,000 members of the armed services viewed the game from grandstands built on the flight deck and listen to a concert featuring the musical acts Five For Fighting, Billy Currington and Navy vet B. Taylor. Concerns about an approaching rainstorm earlier this week dissipated along with the threat of rain, which the National Weather Service now forecasts for Saturday. An alternate playing area was constructed on the hangar deck, just in case. Bob Mazza of Morale Entertainment, which organized the event, raved about the setting. "This venue is absolutely stunning and spectacular," Mazza said. The Obamas arrived at NAS North Island about 12 minutes earlier than expected and were scheduled to depart after the game. They shook hands with Vice Adm. Rick Hunt, the commander of U.S. Naval Surface Forces and his wife, and Capt. Yancy Lindsey, the commanding officer of Naval Base Coronado. As he often does, he bypassed the bulletproof limousines to shake hands with a small group of people who gathered to watch the arrival. He and the first lady then traveled the short distance to the aircraft carrier. Aboard the vessel, they walked out to the playing court on a red carpet. "We are proud to be here and see a great sporting event, but the main reason why we're here is -- on Veterans Day -- we have an opportunity to say 'thank you,"' the president said during about a 4 1/2-minute pre-game speech. He urged Americans to give thanks for military members and veterans every day. He said it was especially important to hold such an event aboard the Carl Vinson. "The USS Carl Vinson has been a messenger of diplomacy and a protector of our security for a long time, and the men and women who serve on this ship have done extraordinary service in the Pacific, in the Persian Gulf, in the Indian Ocean," Obama said. The president has embarked on a nine-day trip during which he will host 21 nations at the annual Asia-Pacific Economic Cooperation summit in Honolulu, travel to Australia and then take part in a summit of Southeast Asian nations in Indonesia, where he spent part of his childhood. Before boarding Air Force One today, Obama placed a wreath at the Tomb of the Unknowns at Arlington National Cemetery during a Veterans Day ceremony. Obama is a huge basketball fan who fills out a bracket for the NCAA men's basketball tournament every March. Michelle Obama's brother, Craig Robinson, is the men's basketball coach at Oregon State.